Oeuf Sparrow Trundle – bring on the slumber party! Did you ever think you’d be encouraging constant sleepovers? Get the new Sparrow Trundle from Oeuf and you might just find this to be the case. It’s new, it’s exclusive and it’s available for pre-order now (though you may want to be quick as these are sure to be popular!). We first mentioned the Oeuf Sparrow range last year and we’re excited to let you know about this new addition to the line. The Sparrow Trundle in all its natural birch finish glory matches both the white and grey coloured Sparrow combinations and nestles effortlessly under the Sparrow bed. This pairing of trundle and bed creates a more ‘seamless’ piece of furniture as the mattress goes unseen – there’s no screaming ‘I’m hiding a trundle’ here! Measuring a roomy 194cm long by 101cm wide, there’s no skimping on sleeping space with the Oeuf Sparrow Trundle. The wheels are hidden from view which I adore – no one wants to see ugly hardware. 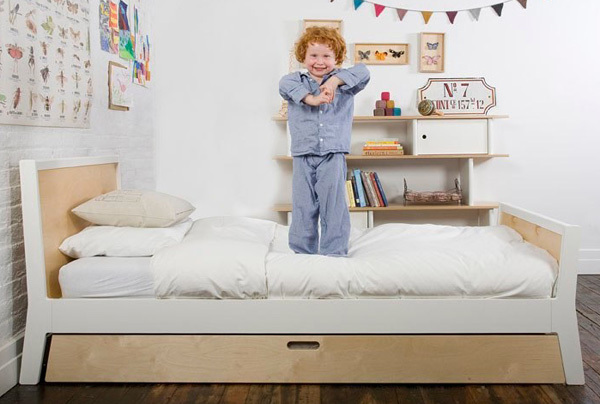 Without the mattress the trundle can even serve as a practical storage space for bedding and large toys or even out-of-season clothing. How useful! The Oeuf Sparrow Trundle is available for pre-order now for $399 from Kido Store with delivery expected in October.